Organizations offering exceptional IT Products, Services and/ or Solutions have been awarded the prestigious distinction of CIO Choice 2015 Recognition. CIO Choice Recognition is a seal of Customer Satisfaction & CIO Endorsement.Participation in CIO Choice is by invitation only and offered to the Market leaders in Information & Communication Technology space. Achieving the CIO Choice Recognition is a great way to strengthen Market Leadership Position and is a Sales Acceleration Tool as it reassures the consumers & suppliers that they are buying the best Products, Services and/ or Solutions in its category. 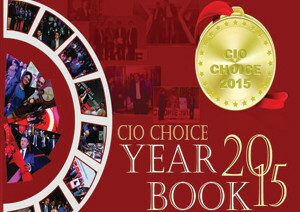 The recognized organizations have been showcased in the CIO Choice 2015 Year Book.